A drawing of a sailboat at sea, in the stern of which a wolf sits with his right paw on a compass, and his left paw holding the tiller. The mast is an olive tree. The compass points straight at an eagle, which is perched on a globe resting on the shore. A rocky landscape forms the background. 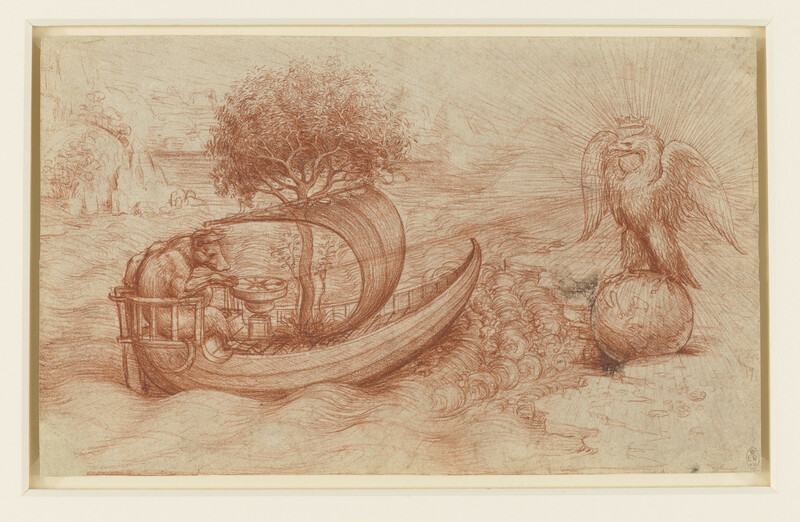 It is generally accepted that the drawing has a political meaning, though suggested interpretations have varied widely - an allegory on the magnetic north pole, on river navigation, or on the relationship between Pope Leo X and King Francis I around 1515-16. The eagle apparently wears the French crown, and the wolf is very probably the Pope, steering the Ship of the Church (in St Ambrose's exegesis the Ship of the Church has as its mast the Cross of Christ; rather than using a pictorially disruptive crucifix, Leonardo substituted the Tree of Life, a branch of which was planted on Adam's grave, itself growing into a tree from which ultimately the Cross was fashioned). Analysis of the drawing style points to a date in the mid-1490s. The dry handling of the red chalk is that of the sketches in Leonardo's Manuscript H (Paris, Institut de France), and the watermark is identical to that on a sheet of studies of men in action of the same period (912643). The comparison with MS H is not confined to style, for that notebook of c.1493-4 contains most of Leonardo's notes on animal allegories and shows that he was at that time fascinated by such symbolism. Excepting the nurturer of Romulus and Remus, the wolf is almost always a negative symbol, of gluttony, rapaciousness and corruption of all kinds - characteristics regularly associated with the then pope, Alexander VI, by his many enemies. In September 1494 the army of Charles VIII of France entered Italy to press the King's claim to the throne of Naples. Though Alexander VI considered ordering the papal troops to resist Charles, his position was undermined by internal dissent and by the end of 1494 Charles was in Rome. Alexander frustrated Charles's demands to acknowledge him as ruler of Naples, but was unable to prevent him marching on the city (taking with him as a hostage the Pope's son Cesare Borgia) and usurping the throne. This seems then to be the context of Leonardo's allegory, a weakened Alexander VI cowering before and being guided by the magnificence of the French King. In the 1490s Leonardo was artist to the Sforza court in Milan, which had been closely involved with the affairs of Alexander VI. But in 1494 Ludovico Sforza abandoned his carefully forged alliance with the papacy, realigning himself with the French and allowing the troops to march through Lombardy unopposed, and the prevailing sentiment at the Milanese court would have been openly pro-French. The sheet was probably a finished work of art intended for a member of the Sforza court. The drawing does not bear a Melzi number and may have a different early provenance from the bulk of the Leonardos at Windsor. Adapted from Royal Treasures, A Golden Jubilee Celebration, London 2002. For a fuller treatment see M. Clayton, 'Leonardo's Gypsies, and the Wolf and the Eagle', Apollo, August 2002, pp. 27-33.